Will New Zealand Rebuild The Cathedral My Forefather Erected? : Parallels NPR's Philip Reeves recently visited the earthquake-battered cathedral in New Zealand built by a 19th-century ancestor. He found his family history entwined in a fierce contemporary controversy. 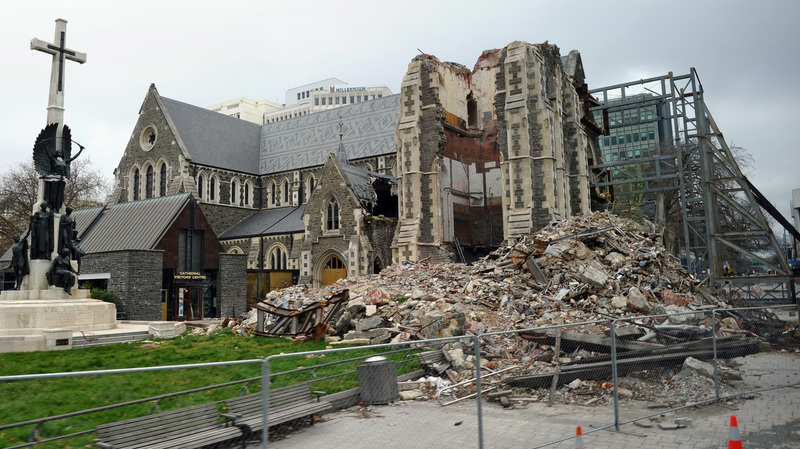 The badly damaged Christchurch Cathedral is pictured on Sept. 7, 2011 during a tour given to foreign journalists visiting the city ahead of the rugby 2011 World Cup. England rugby manager Martin Johnson and several members of the playing squad visited the city to see the stadium and the city center which were damaged by an earthquake in February. He has a swirl of graying whiskers stretching down to his collar, yet he wears a tiny mustache so precisely groomed that it almost could have been typed. His face is confident and stern, befitting a gentleman of substance. For weeks now, I've been studying these features, wondering about the man behind them. They're on the faded cover of a biography that I found during a recent bookshop rummage. His name is Henry John Chitty Harper. The book bears the intriguing title Do Nought Without A Bishop. Harper happens to be my great-great-great grandfather. That's no great claim to fame — he has a multitude of descendants, as you'd expect of a 19th-century Anglican cleric who produced 15 children — but he particularly interests me because he was a driving force behind the creation of a historic building, which is now at the center of a prolonged argument causing painful divisions in a disaster-struck city. Harper was the first bishop of Christchurch in New Zealand. He battled to build the Anglican cathedral that, for more than a century, was the city's centerpiece, its greatest landmark and an inspiration behind its logo. On Feb. 22, 2011, Christchurch and the surrounding area was hit by a ferocious earthquake that claimed 185 lives, and wrecked thousands of homes and businesses. The cathedral's spire came crashing down. Since then the church has been shut, occupied only by a congregation of pigeons roosting in the rafters. Great-great-great grandfather Harper was among a community of Anglican settlers who sailed in from faraway Britain in the 1850s and set about building Christchurch on a swampy landscape halfway up the eastern edge of New Zealand's south island. The country is in the South Pacific and has a Maori population whose ancestors arrived centuries before Europeans set foot on its shores. However, the new arrivals were intent on creating a city that brought the old world to the new by styling itself on a refined English provincial town. Their grandiose aspirations were reflected in the cathedral's neo-Gothic design, the work of a celebrated British architect of the Victorian age, George Gilbert Scott (famous, among other achievements, for St. Pancras Station and the Albert Memorial in London). For decades, Bishop Harper worked to raise funds for the cathedral, every year donating a sizable chunk of his income. On a rainy summer's day in 1864, he laid the foundation stone. It was a colorful occasion: Christchurch's top brass, including the sheriff, judge and five newspaper editors, paraded through the streets accompanied by a throng of choristers in flowing robes, military volunteers and a band. They gathered on the patch of ground staked out for the cathedral, made some speeches, sang the Hallelujah Chorus, buried a bottle containing some Latin inscriptions, and lowered the stone into the ground. It bears the early Christian symbol of a fish. In 1893, Harper died. His obituary in the local newspaper, The Press, says that although he died a "beautiful death," his "great ambition was to see the cathedral completed." He didn't fulfill that dream — another decade would elapse before construction was finally finished. Not long ago, I visited Christchuch, New Zealand's second-largest city, for the first time since going there as a student in the mid-1970s to stay with my grandparents. I had remembered it as a confident, tranquil place, whose only flaw was a tendency toward snobbery. 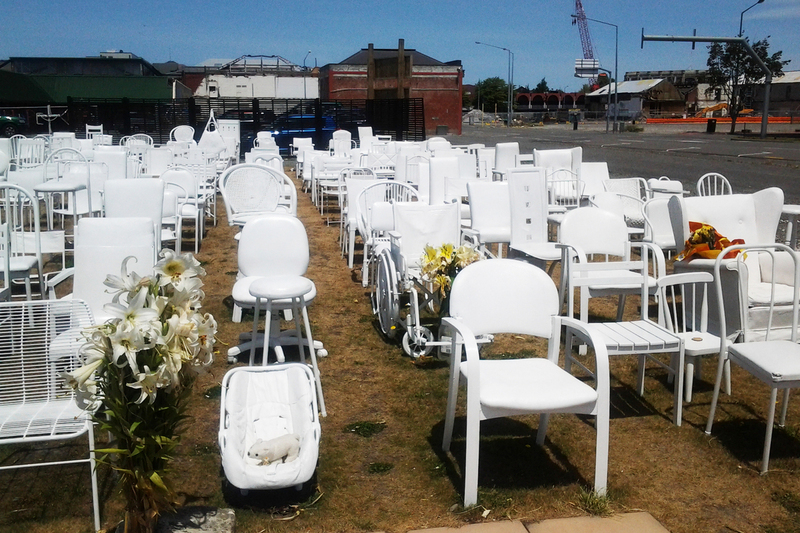 A memorial comprising empty chairs commemorate the 185 people killed by the Christchurch earthquake on Feb. 22, 2011. I read beforehand about the 2011 quake, the bigger but less damaging earthquake of 2010 and the 14,000 or so aftershocks that continued wearing away at the city's nerves for 18 months — and also the evil-smelling, highly destructive, primal sludge that oozed out of the ground because of all this seismic upheaval. Until I arrived, though, I had no idea of the scale of the damage, or of the enduring mental scars caused by these disasters. People used to feel secure, Rosie Belton, an author and resident, told me, during my recent visit. "We lived with this feeling of how safe we've made our lives — you know, we've got our life insurance, we've got our health insurance, we've got our house insurance. We think the ground's 'terra firma,' " she said. That view changes completely after you've lived through "watching the ground roll around, trees swing around and buildings crash down around you," she said. The quakes were a "reminder that human beings are visitors on this planet, and that we need to have a lot more respect for what it can do." Despite lingering trauma, post-quake Christchurch radiates a certain degree of defiant optimism. Planners have produced a multibillion dollar blueprint to transform the city center, much of which has been demolished. Big colored murals brighten up empty spaces and there are pop-up stores in shipping containers. All around, construction seems to be underway. 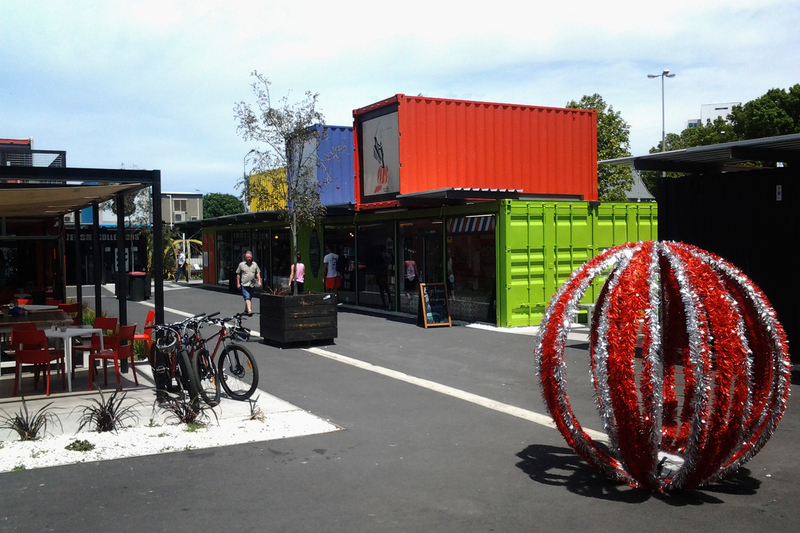 Pop-up stores and cafes in shipping containers cheer up the center of the earthquake-battered city. This contrasts strikingly with the sad hush that engulfs the battered cathedral. It's deconsecrated and in limbo, paralyzed by a dispute over its fate. Worshippers now gather a few blocks away, in the new "transitional" cathedral. It's a stark, brightly lit, tent-like structure made, in part, from cardboard tubes. It's designed by Shigeru Ban, a Japanese architect who has won worldwide acclaim for creating innovative, easy-to-build structures for disaster victims. 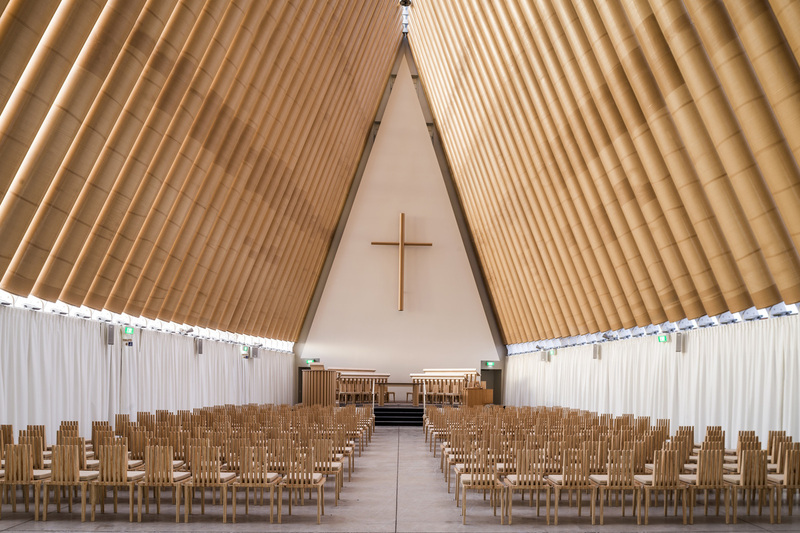 This undated image released by the Pritzker Prize shows a cardboard cathedral in New Zealand designed by Tokyo-born architect Shigeru Ban, 56, the recipient of the 2014 Pritzker Architecture Prize. The argument over what should happen to Christchurch's original cathedral has been through many twists and turns, and several courtrooms. Throughout, the building has remained fenced off, behind "danger signs" and security cameras. Until recently the Anglican diocese seemed determined to knock it down and build a modern replacement. Several campaign groups are fighting hard to stop this, arguing that much of the cathedral is intact, and that it can be restored for an affordable price and made earthquake-safe. You only have to skim through the comments from readers that accompany media coverage of the church's fate to see how sharply this issue divides public opinion. Posts attached to an article published in March range from "just demolish the damn thing" to "Please SAVE IT." Big themes underlie this debate. New Zealand has moved beyond its colonial past; should it preserve its English heritage, or set that aside in favor of new cultural expressions of itself? Or should its history be preserved, no matter what view contemporary society takes of its value, because it is, after all — history? Ross Gray, of the Restore Christchurch Cathedral campaign, takes the latter view: "It's about knowing where the hell you have come from, and therefore whence you might go. And as people say, a city without heritage is like a library without any books." In March, a proposal drafted by a top New Zealand architect encouraged some to hope that a solution might be emerging. It's a plan to rebuild the cathedral with a modern wooden interior, dramatically reducing the weight of the building; the exterior would resemble the Neo-Gothic original. The Anglican authorities appear to be leaning in favor, but there are plenty of critics of the plan, and the argument likely will run on. It's clearly up to the people of Christchurch to decide the fate of their cathedral. What business is it of mine? But I guess it would be nice if enough was preserved to ensure that great-great-great grandfather Harper's efforts do not, after all these decades, come to nought.